Hey Everyone! I hope you are all well and have had a lovely Bank Holiday Easter Weekend. 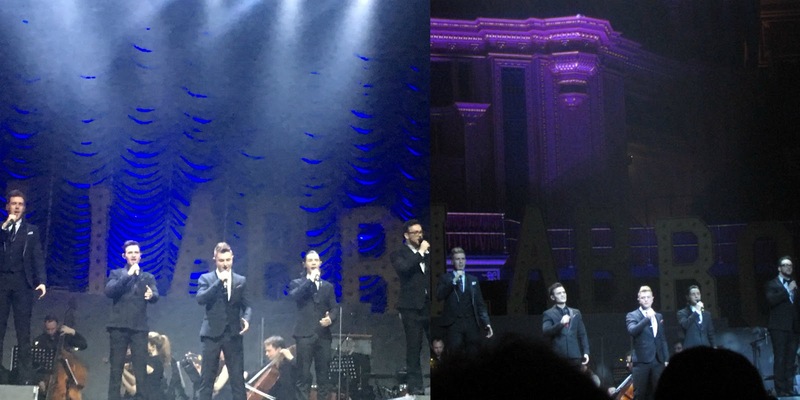 I've had a lovely week and weekend going to see different shows and as you can tell from the title of this blog post I will be writing all about Collabro's incredible Act Two Tour that they are currently on and sadly coming towards the end of! Collabro if you didn't know were the 2014 Winners of Britain's Got Talent and are comprised of five members, Jamie, Michael, Richard, Matt and Tom. Come join me on this amazing night. Since winning Britain's Got Talent they have had two top 2 albums (their first reaching number one), have had amazing success in the USA and Japan touring at both these places and have enjoyed two sell out tours in the UK. As you probably will know if you follow me on social media I tend to support these boys a lot. I went to their tour last year, bought both albums, constantly tweet them messages of support and I've been lucky enough to meet them numerous times for which I'm very grateful for. 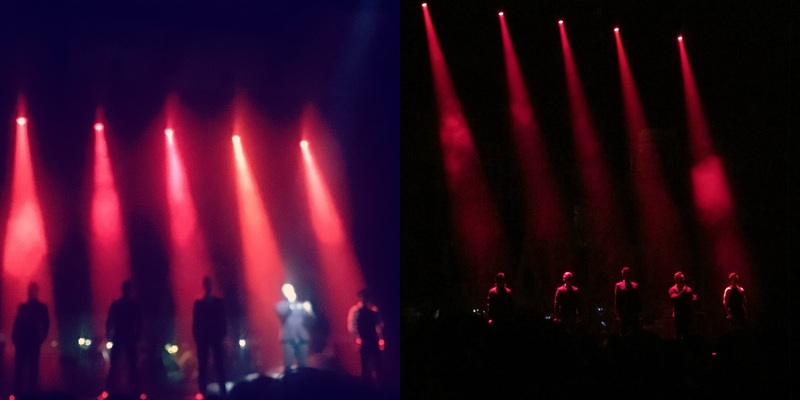 Last week I was lucky enough to go to both their shows in London. I went to Watford on the 22nd March and then on the 26th March I was lucky enough to be at their sell out show at the Royal Albert Hall which was absolutely incredible. 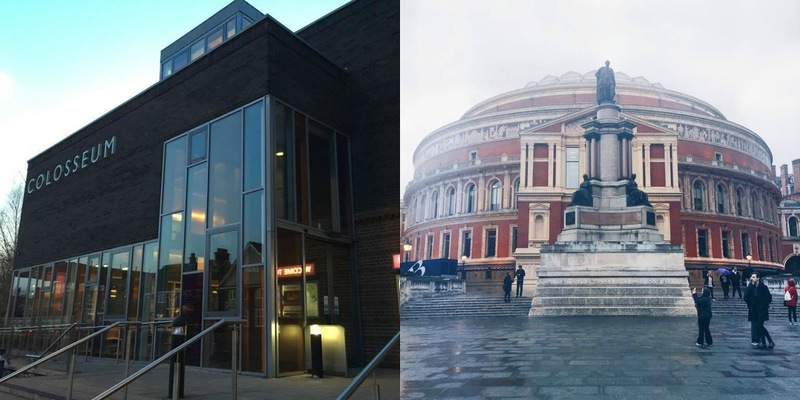 Keep on reading to find out more about this amazing tour which will consist of photos from both the Royal Albert Hall and Watford. Their set up of this tour was slightly bigger and more extravagant than last year! They were performing in bigger venues so obviously had to alter the set to make sure to take up most of the stage. They had a bigger orchestra this which were placed in the centre of the stage in comparison to at either side last year. One thing remained the same on this tour and that was their name spelled out in big bright flashy lights which I personally found amazing and it really highlighted the fact it was their show! I had amazing seats at both venues. At Watford I was in the 8th row in the middle and then at Royal Albert Hall I was on the 16th row at the side in the arena bit and again had an amazing view! 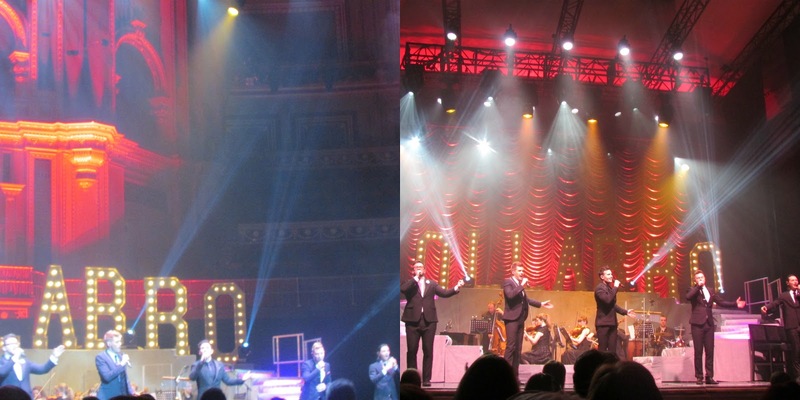 What I love about seeing Collabro is that the audience isn't screaming and talking throughout the whole show. Everyone just sits back, relaxes and appreciates the talent on stage and I absolutely love that. 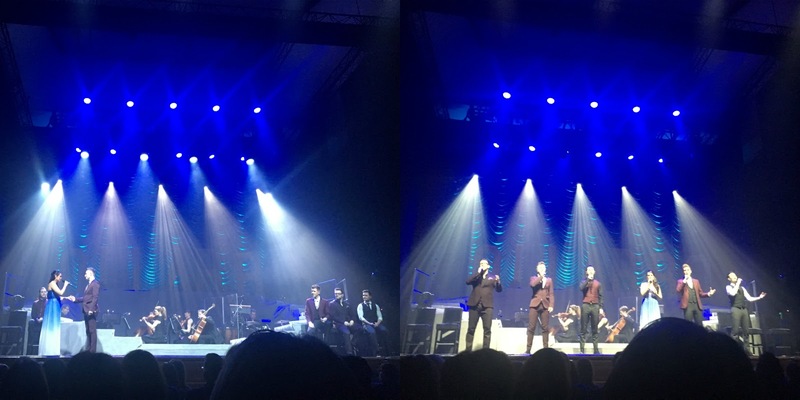 You can really hear their beautiful voices and all the emotion that goes into every song which makes a Collabro show just that little bit more special. When it comes to seeing my favorite bands and singers one thing I absolutely love is seeing who their support acts are. Collabro are very supportive and appreciative of new talent so I was very interested to see who they chose to support them. They chose an amazing singer songwriter called AJ Brown who admittedly I'd never heard of before this tour but who I absolutely adore now. His songs are so beautiful and he has the most incredible voice. He was very engaging with the audience making them laugh, sing and clap along during his 30 minute performance which I absolutely loved. He performed an amazing rendition of Bridge Over Troubled Water which is one of my all time favorite songs so that made me extremely happy. During the interval at Watford and Royal Albert Hall he was in the foyer meeting people and signing copies of his album and I did want to meet him and say hi but as you can imagine he was very popular and I unfortunately didn't get the chance to. I did however buy his album which I absolutely love. My favorite song by him is Zip-A-Dee Kind Of Love as it's so beautiful and it's something that I can relate to. I've followed AJ on facebook and twitter and like with last year's support act Philippa Hanna I look forward to seeing what he does next after this tour. Last year the beautiful Lucy Kay who was runner up on BGT the same year Collabro won was the surprise guest for Collabro on their first tour. I was very interested to see who the surprise guest would be for their Act Two tour and was super happy when the beautiful Catriona Murray was announced. I first came across Catriona when Jamie posted about her on twitter and told people to follow her and check out a few youtube covers she had put up. From her very first cover on youtube I instantly fell in love with her voice. She is such an incredible soprano. She performed some incredible covers of some musical theatre tracks which included 'I Could Have Danced All Night' from My Fair Lady, 'You'll Never Walk Alone' from Carousel and two of my favorite songs from Phantom of the Opera 'Think Of Me' & 'Wishing You Were Somehow Here Again'. She also performed a couple of other songs too but I'll get into that later. At the tour Catriona was also selling and signing copies of her album during the interval and I definitely bought a copy and I absolutely love it. It's full of incredible musical covers and a few well known operatic pieces as well. This album literally gave me goosebumps when I listened to it for the first time. I had spoken to Catriona quite a bit on twitter before heading to the show but I was lucky enough to finally meet her on both tour dates and she's just the sweetest most beautiful girl. I look forward to seeing where this amazing stint with Collabro will take her as she's incredible. After AJ Brown, the orchestra came on and played some snippets of songs that we would be hearing throughout the show which was so lovely. After about 3 minutes of this the boys rose up from the top of the stairs and began singing their first song which was 'Circle Of Life' which is one of my all time favorite songs from one of my favorite Disney films 'The Lion King'. It was such a beautiful performance and it was so lovely to see them perform this first song as they look around the venues at all the people their to see them with huge smiles on their faces. I was grinning like a Cheshire cat all the way through Watford because of this as you can tell just how much it means to them. Another song they perform on the tour which I can't seem to find the photo for is All I Want from The Fault In Our Stars which is such a beautiful and emotional track! If you've seen the film you'll know what I'm talking about! The boys put so much emotion into that song and it's just so beautiful. 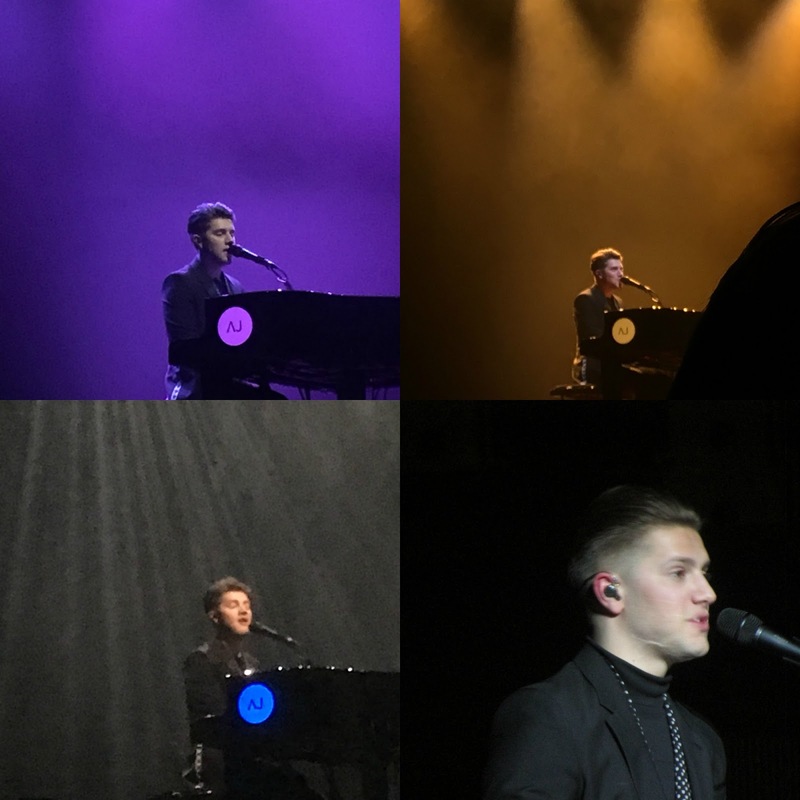 Here's a few more photos that I took from Watford and Royal Albert Hall with the song list in no particular order other than the first and last song! Something a bit different from the usual pop/musical crossover covers the boys do. They've taken one of the oldest songs I know and completely transformed it into a modern day fun song that we can all sing along and dance to. They started doing it is I've always loved this song however there's something about Collabro adding their own unique touch that makes it just that little bit more special and enjoyable. I absolutely love it. One of my favorite songs in the entire world is The Prayer. It is just so incredible beautiful. The melody, the lyrics and the passion put into every performance I've seen is always incredible. Catriona rejoins the boys for this amazing duet and it reduces me to tears every time. It's just so beautiful. 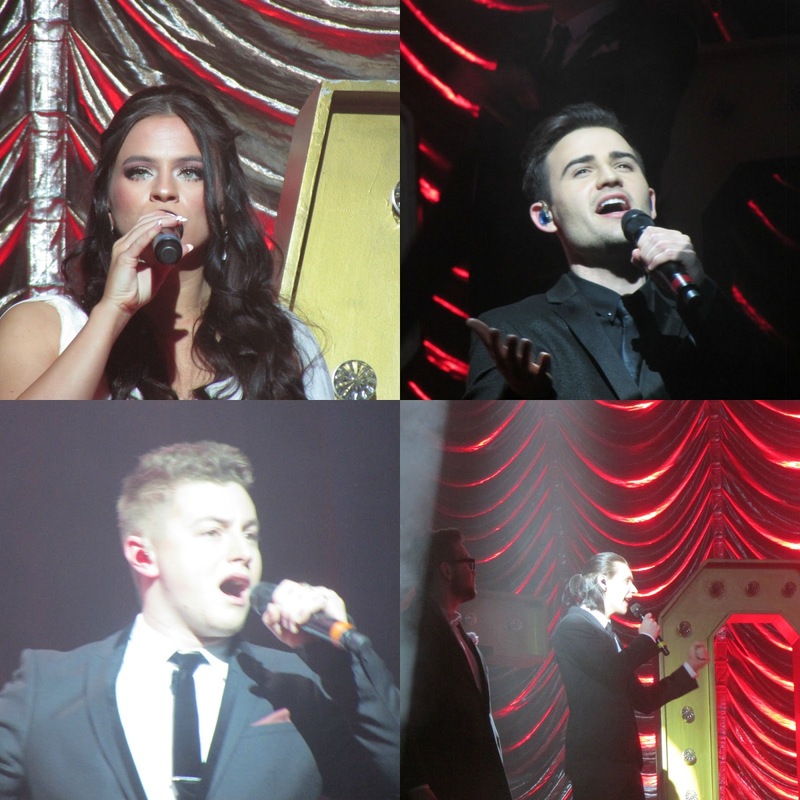 All six of their voices blend so well together and what I think I love most about this performance is how much the boys appreciate Catriona's talent and presence on the tour with them. It's just so beautiful to watch. This was absolutely amazing. 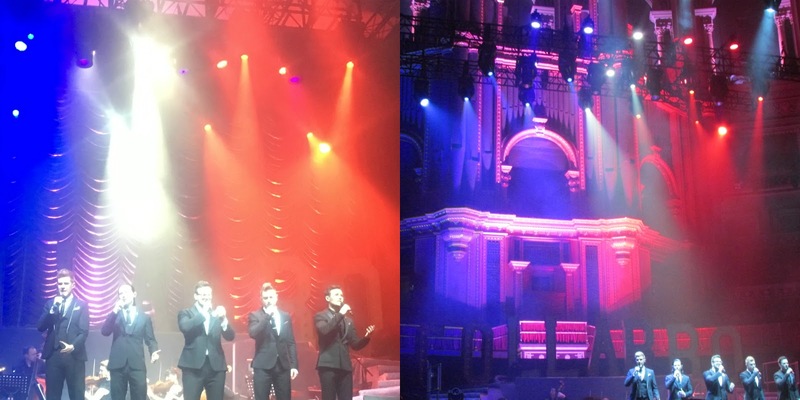 Collabro are all about trying out new styles of music to keep things interesting and one of their favorite genres is swing so they decided to put a spin on the Funny Girl classic 'Don't Rain On My Parade' and make it into one of their own and it was absolutely incredible. This is one of my favorite songs ever thanks to Barbara Streisand and Lea Michele. Everyone was on their feet dancing and clapping along and the atmosphere at both these venues especially Royal Albert Hall was just electric. Definitely one of my favorite numbers of the night and an absolutely incredible version. I hope they do more covers this way as it was thoroughly enjoyable. This song is just so beautiful and means a lot to many Collabro fans as this is the song that got them to the final of BGT two years ago. It's so beautifully sung and I just love the lighting. If you've seen the actual musical then you'll know that the lighting used here in the show is very similar to that used on the west end. This song means the world to the boys and you can really hear how much when they perform it. It's beautifully done. This was new to their set list. Collabro are always trying out new songs and turning them into their own style and I was so excited to his this song, originally done by Mumford and Sons. I absolutely love the band and this song is one of my favorites so I was extremely excited to hear their version and wasn't left disappointed. It was just so incredibly beautiful. They actually sit down for this song but I took the photo after they had stood up. I hope this is one their next album as I love it so much. Half way through the show the boys take the opportunity to take a selfie with the entire audience from the stage using a selfie stick, something they did last year and as it went down so well they decided to bring back this year which I love! After that they stand back and allow the audience to take some shots of them smiling and pulling funny faces. Head on over to Collabro's facebook page or @Collabro on twitter in order to see the selfies they've taken on their tour so far. This part of the show is absolutely unbelievable. The energy on stage from absolutely everyone is incredible. After the boys perform music of the night Catriona comes back on stage to perform two songs from Phantom, Think Of Me and Wishing You Were Somehow Here Again. 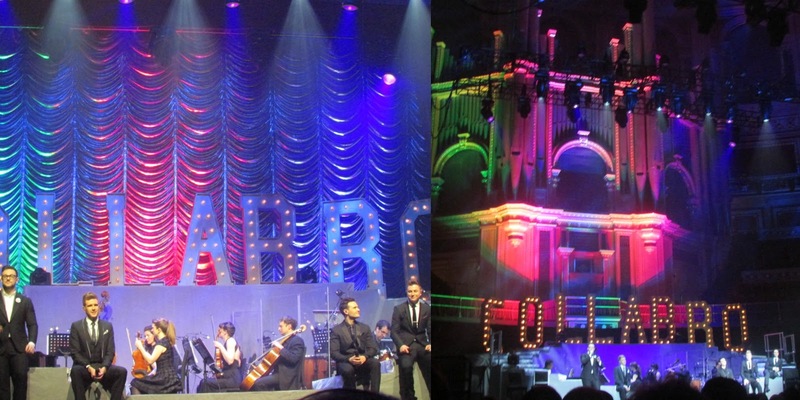 Both of these are absolutely incredible and at the Royal Albert Hall nearly reduced me to tears. 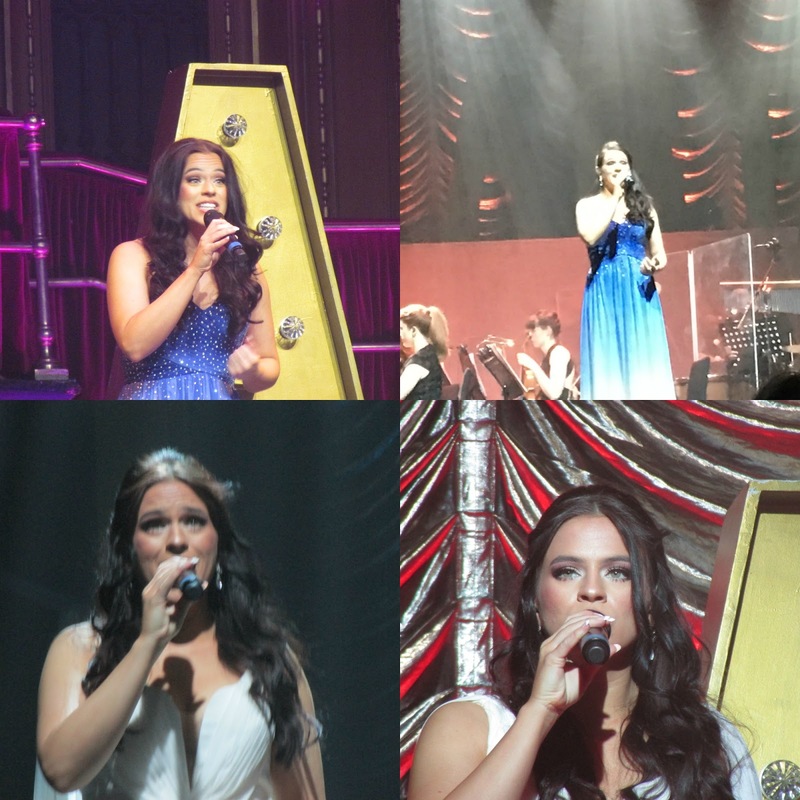 Her voice contains so much emotion and power and those high notes are just unbelievably spine tingling. She really is a star! After this the boys rejoin her on stage for an absolutely spectacular performance of the title track Phantom Of The Opera and it's just absolutely incredible. All the boys take turns in being the phantom whilst Catriona is Christine and it's just an amazing performance. I'd love to see Catriona play Christine on the West End as she has an incredible voice! If you're reading this and have tickets to any of the remaining dates, you'll love this section. It's my favorite section by far! Words can't describe how absolutely incredible this is live. Since the release of Act Two Collabro have done a number of performances however they've not performed this song live until this tour. (I don't think anyway). This is the penultimate song of the show and it's just so beautifully done. The vocals are incredible. So much passion and emotion, especially towards the end. It's just so beautiful. It reduced me to tears at Royal Albert Hall. Like with last year's tour they ended both nights with an encore of the song that won them Britain's Got Talent. This song was greeted with applause and cheers in Watford and even people (including me) waving their torches in the air at Royal Albert Hall which was a bit of an emotional moment for us as fans and the boys up on that massive stage as well. On completion of the song the boys had thunderous applause and cheers and rightly so. 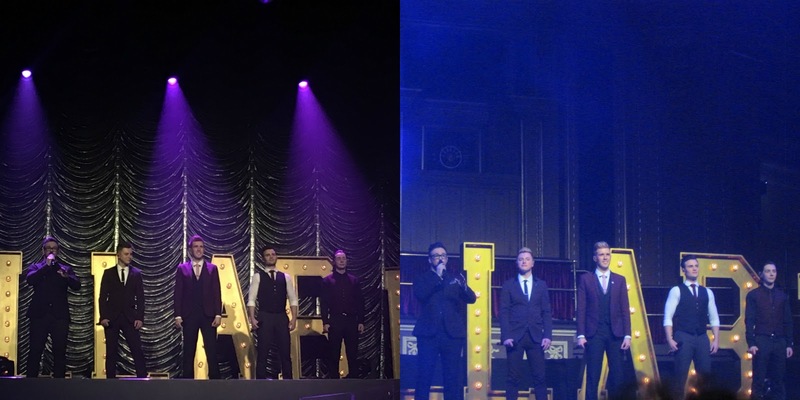 Collabro are by far the most vocally talented boyband out there. They sing with so much emotion that it's so hard to not get emotional or swept up in the moment. You might even find yourself singing along at times like I did. They are also 5 of the nicest guys you will ever meet. They do what they can to make their fans happy. I was lucky enough to meet three of them with a few friends before the show and they happily took photos with us before heading inside to sound check. Throughout the shows at both venues they thanked their fans profusely which made all of us smile as it's so lovely to find a down to earth successful band who appreciate everything and everyone around them. I'm so sad that I won't be seeing them live again on this tour as I've had such a lovely time experiencing everything and meeting other fans at different venues, especially at the Royal Albert Hall but I hope to get tickets to more venues next year! That's one thing we can all look forward to. A new album with even more amazing songs! If you want to see Collabro now's your chance! The boys have six tour dates left including tonight and you can find them at the following venues. Be quick though as tickets are selling fast for the last few remaining dates. 3rd April - Guildford G Live (Sold Out). I hope you enjoyed this post. I can't help but feel like I've missed a song out from this list here but you get the general idea of what they perform. If you are just finding out about Collabro for the first time then I hoped you enjoyed this post. You can find both their albums over on itunes and spotify as well as in HMV and on amazon and places like that. If you have been lucky enough to witness the boys live on this tour...or even their last tour...then I'm sure you agree that they are just a joy to watch. If you have been lucky enough to see them or are going to see them on the next six dates then be sure to let me know in the comments what you think. 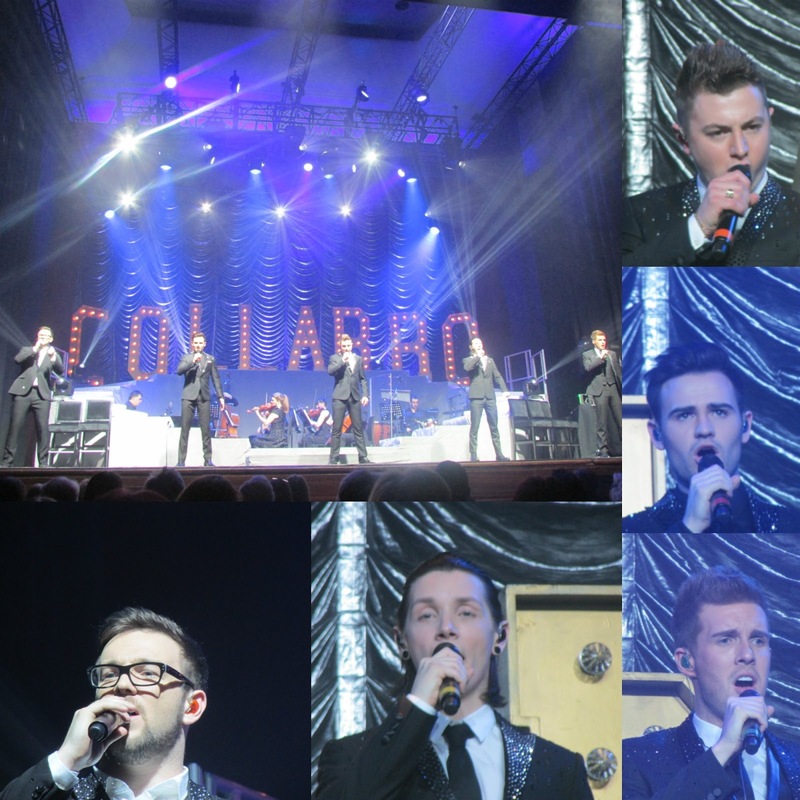 Are you a fan of Collabro? Will you be checking out their albums after reading this post? I'm going to see them tomorrow night. Could you give a rough idea of how long the concert is. It looks like it was amazing. Hello there, I saw them last year, this year I have seen them at Blackburn and Manchester, I am also going on 1st april to see them again in Grimsby, they are just awesome, and I am looking forward to a new album and a 3rd uk tour. Looks like you had such a fun Easter weekend! I am going tonight in Guildford - SOOOO looking forward to it. You had a fab time by the sound of it ! Loved them from their first audition on BGT - especially SC's raised eyebrows when they said they had been together just a month. Just shows eh !! !